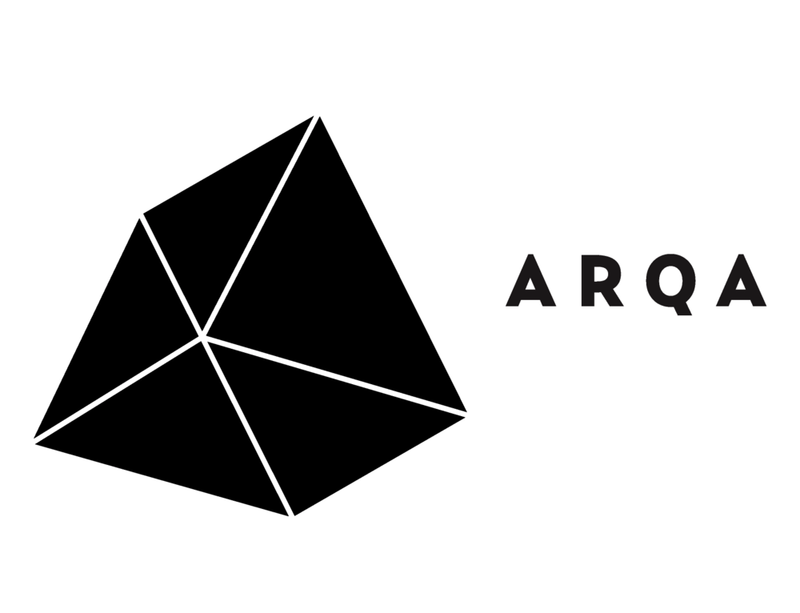 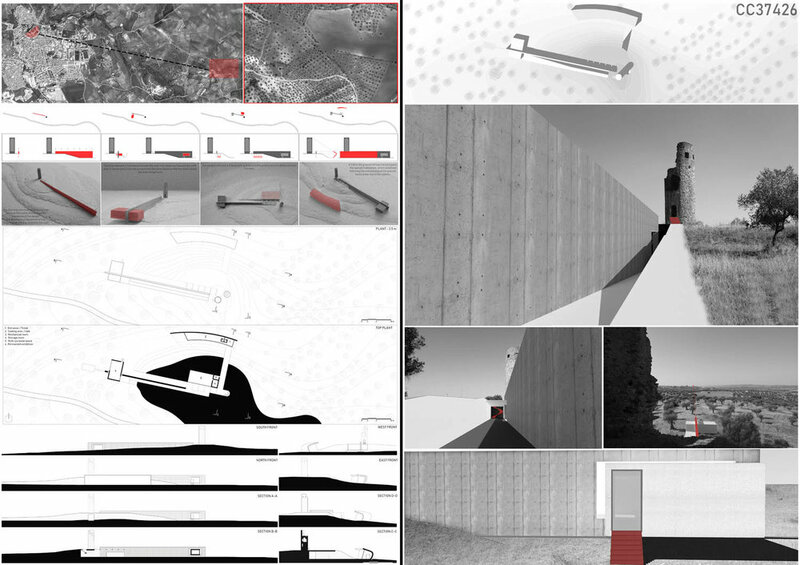 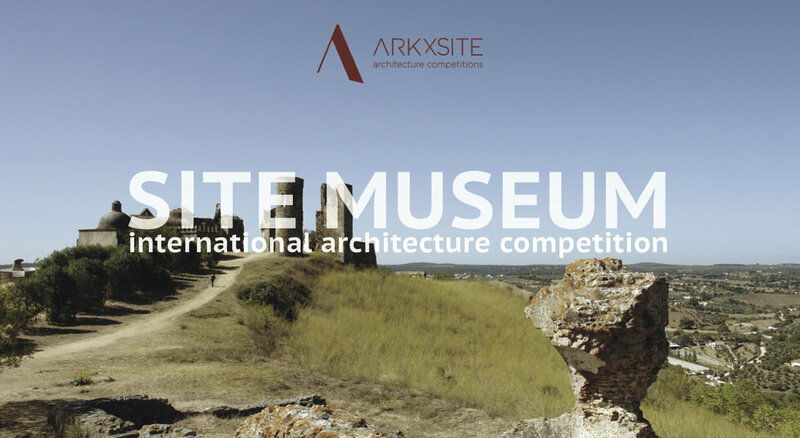 The results are composed of (6) teams of young professional architects and (4) teams of architecture students! 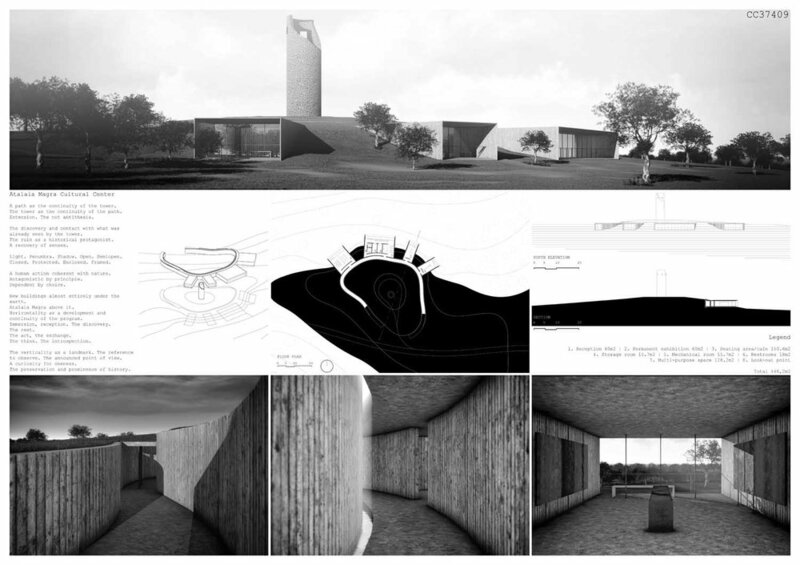 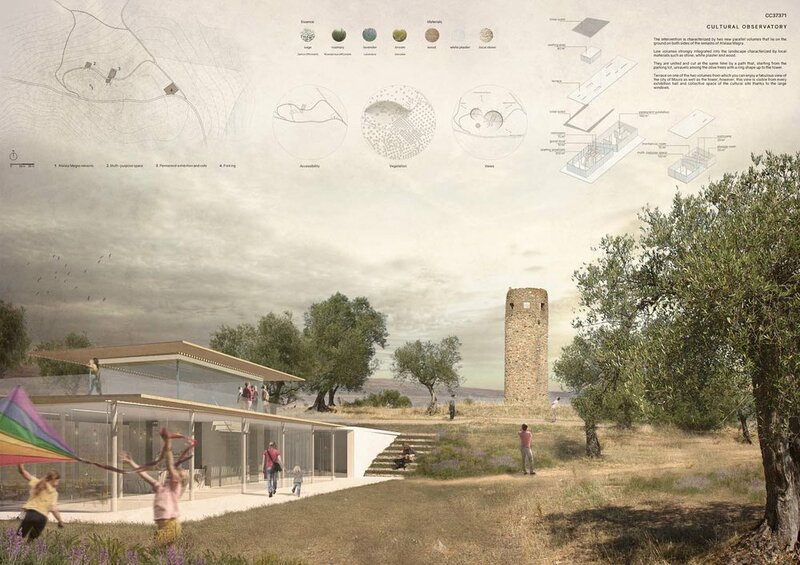 The intervention emphasizes the tower and its natural context. 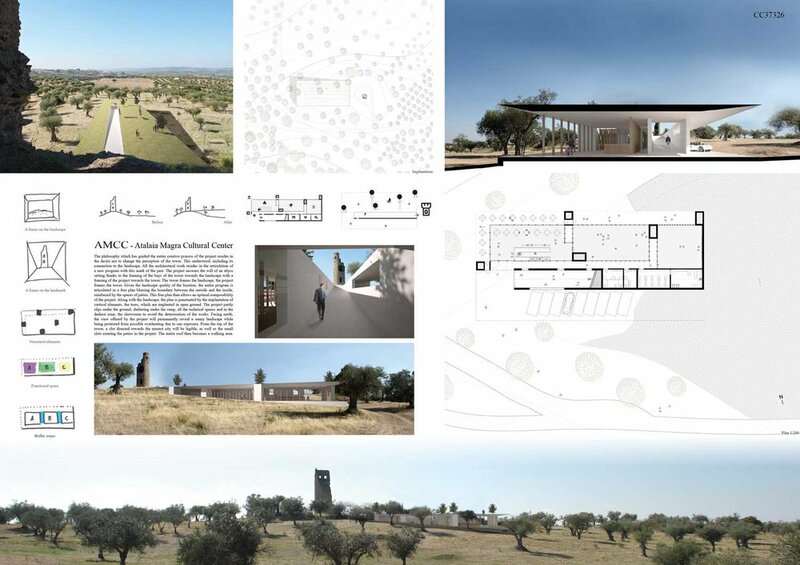 By burying most of the program achieves to disappear and at the same time be present in a subtle and integrated construction, which helps the visitor to understand the site. 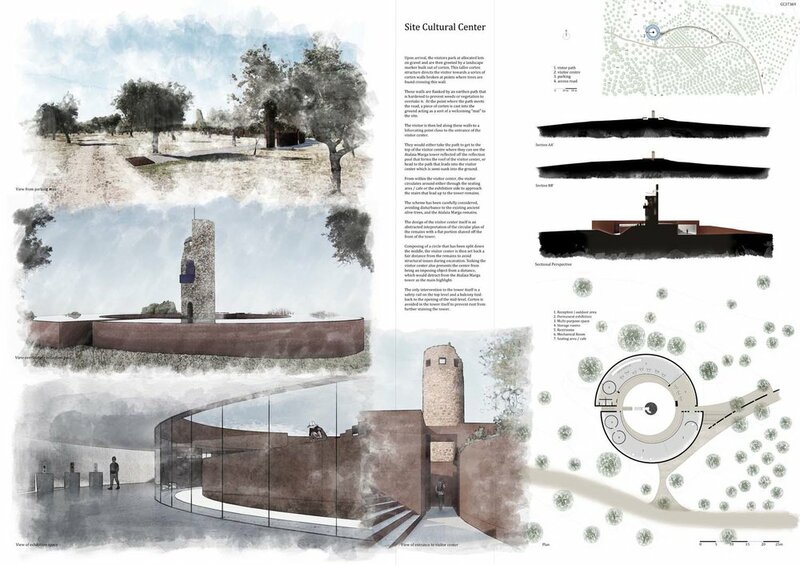 The best asset and feature this project has is that it doesn’t try to envolve the tower with a solid volume or limit, but instead it integrates it within an empty space in the form of a small plaza and encloses this new public space with the subtile pavilion. 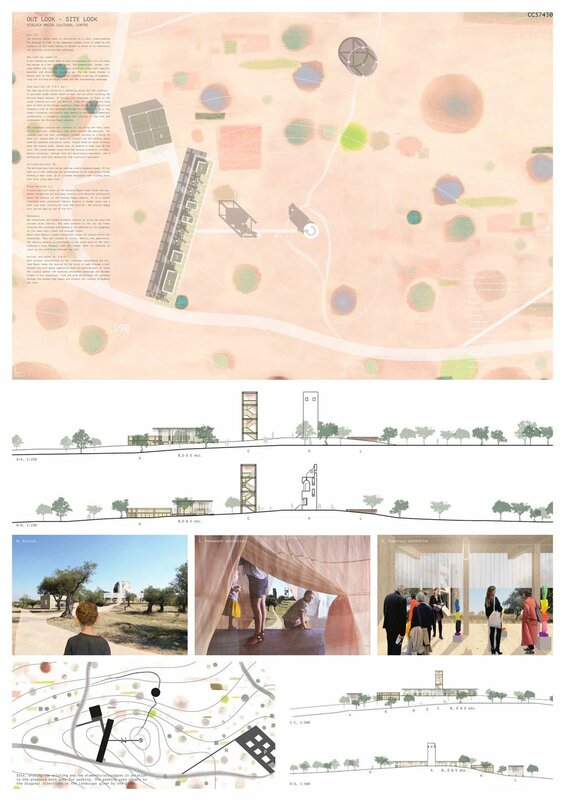 The arrangement of the plan is very well achieved. 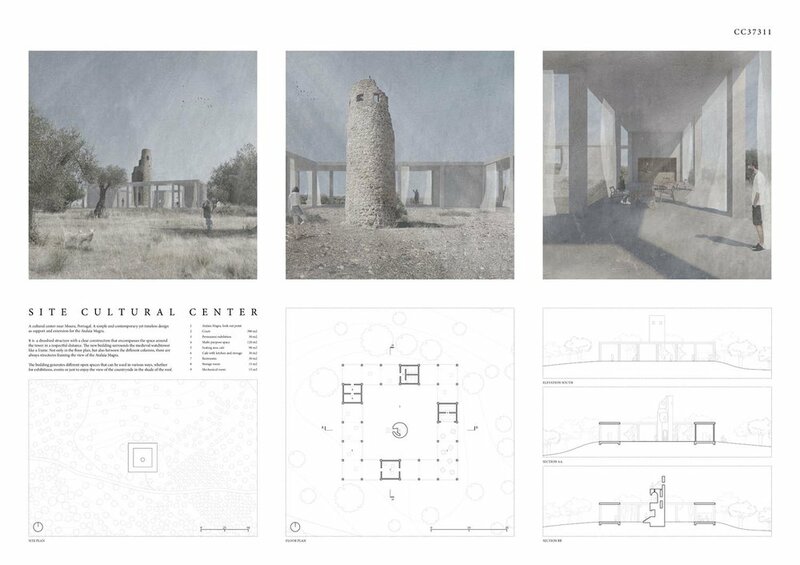 Boldly marking the position of the ruins in the landscape the new Cultural Centre presents the Atalaia Magra’s contemporary horizontal counterpart. 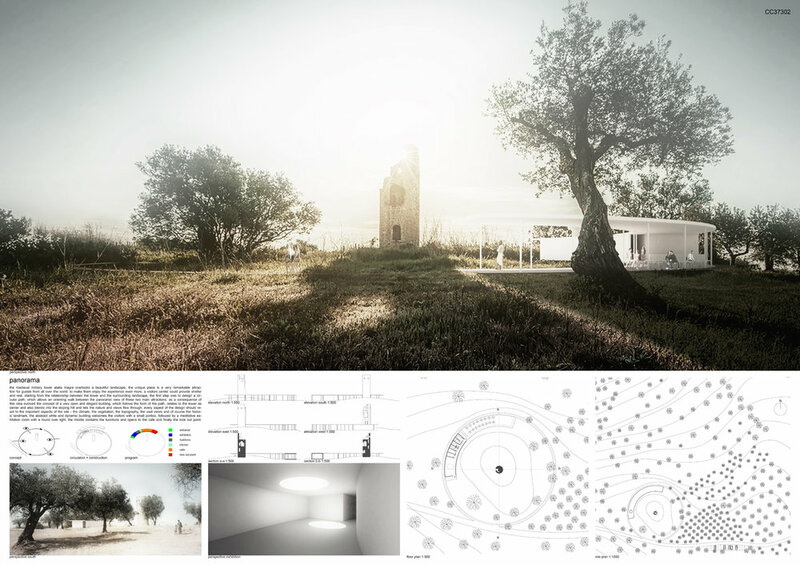 Without unnecessary physical contact, the new and the old become one united architectural entity. 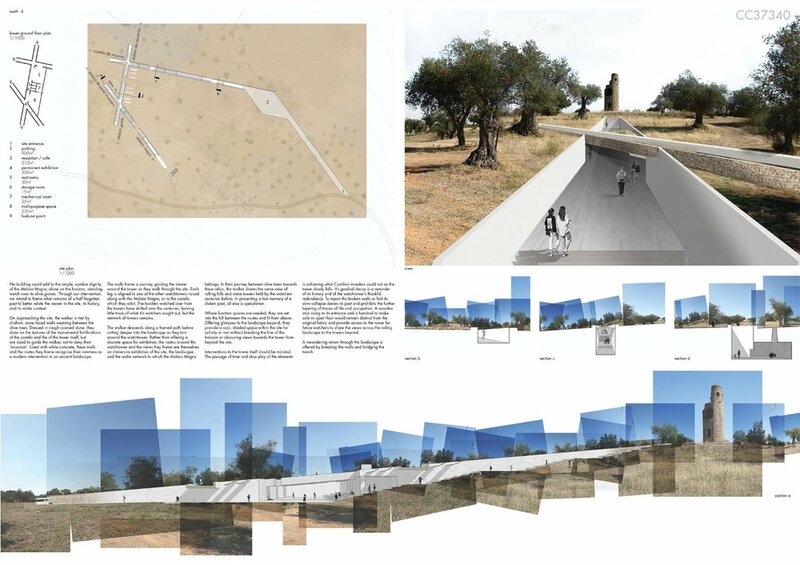 Carefully conceptualised route masters visitor’s experience entering across the landscape through the immersive ramp and linear sequence of spaces to the framed view at the end of the building, which meets the landscape there again. 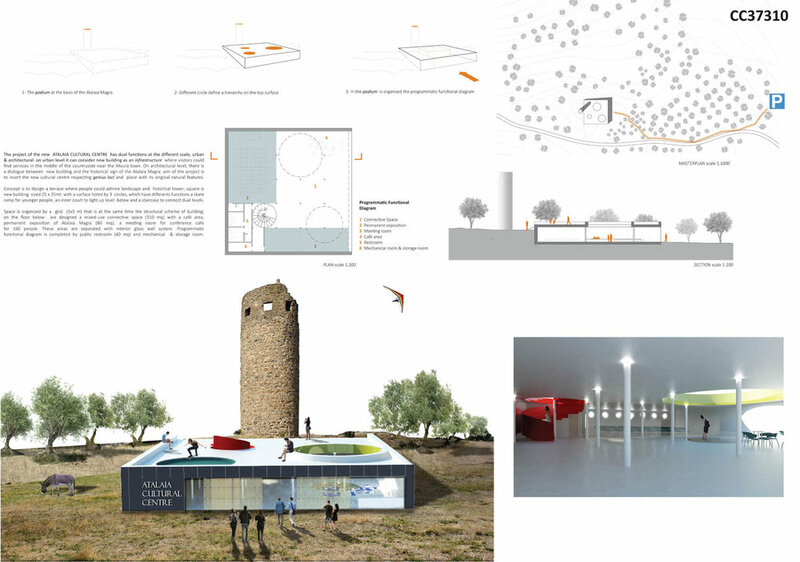 The intervention allows the visitors to approach the tower and its surroundings in different ways. 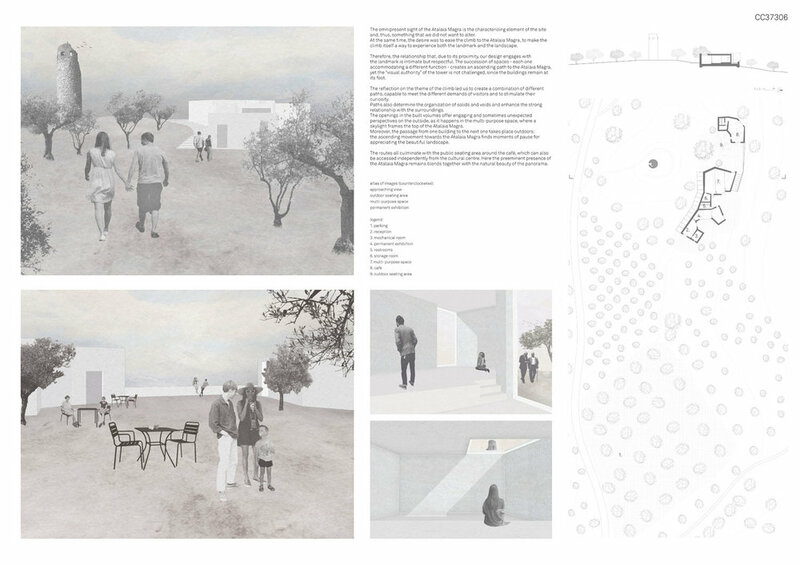 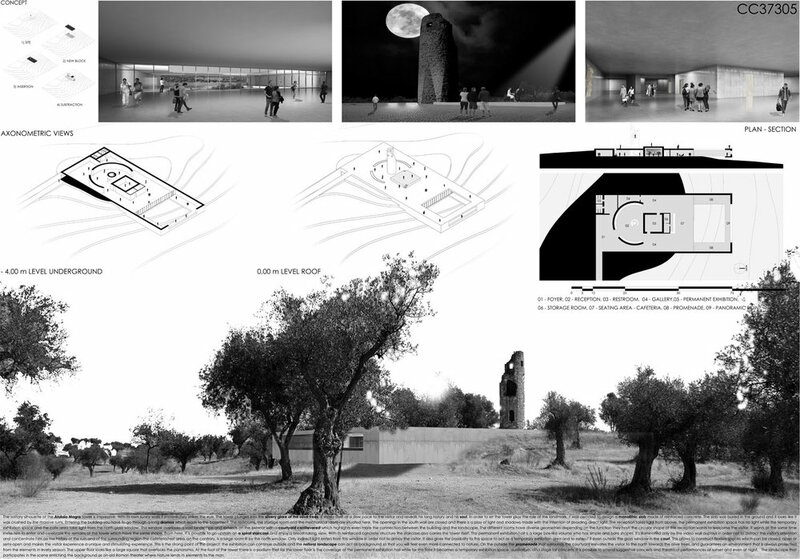 With a simple gesture it organises the centre in a perpendicular volume which contrasts and dialogue with the tower. 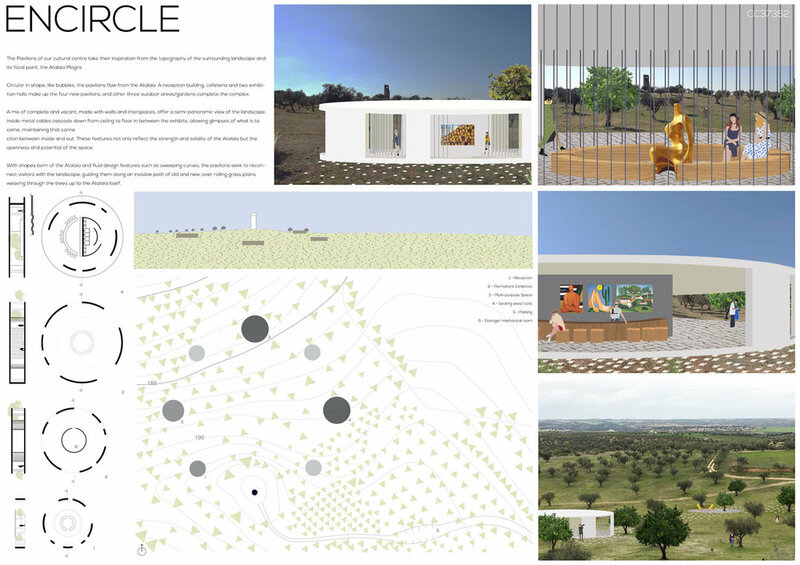 The concept and intention of this project is very strong and well achieved by it’s representation and plan. 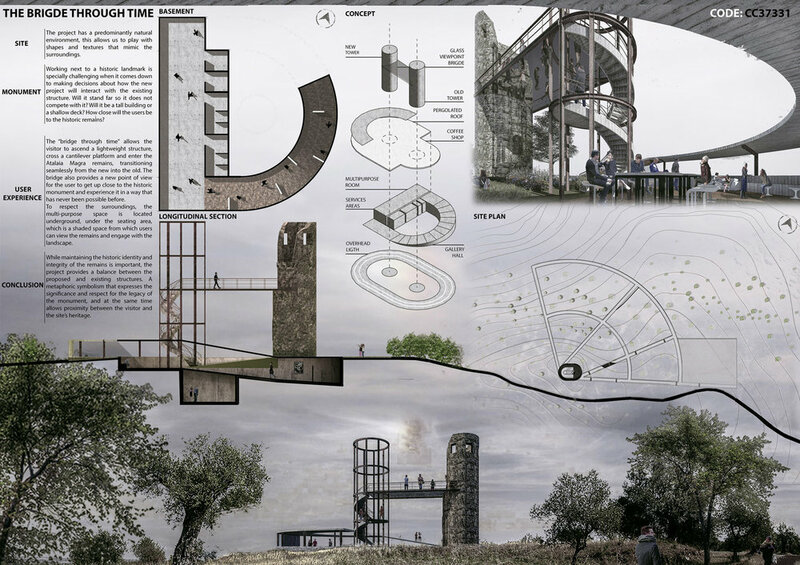 It is a strong gesture that the tower interrupts the new volume and the path passes through it, and again, no volume or construction interrupts the view nor the relationship of the tower with it’s surroundings. 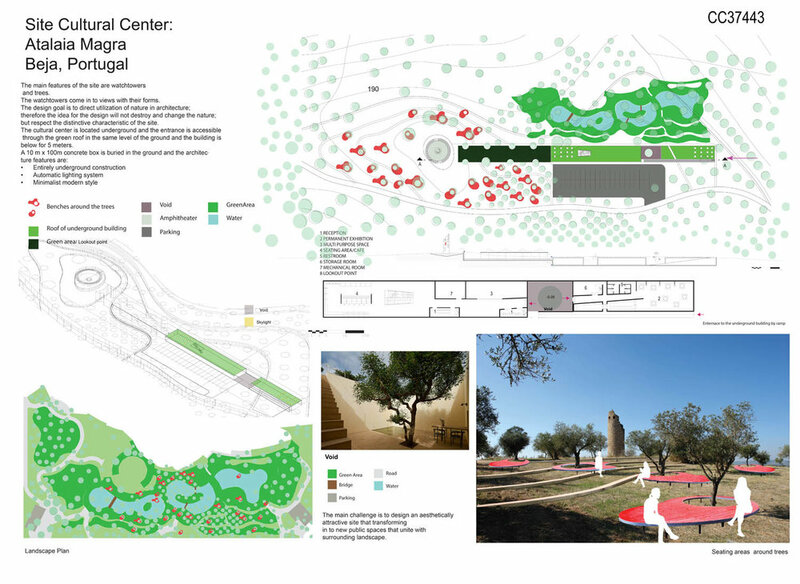 In safe distance to Atalaia Magra the ring of the Cultural Centre seeks context in topography and nature of the site’s landscape. 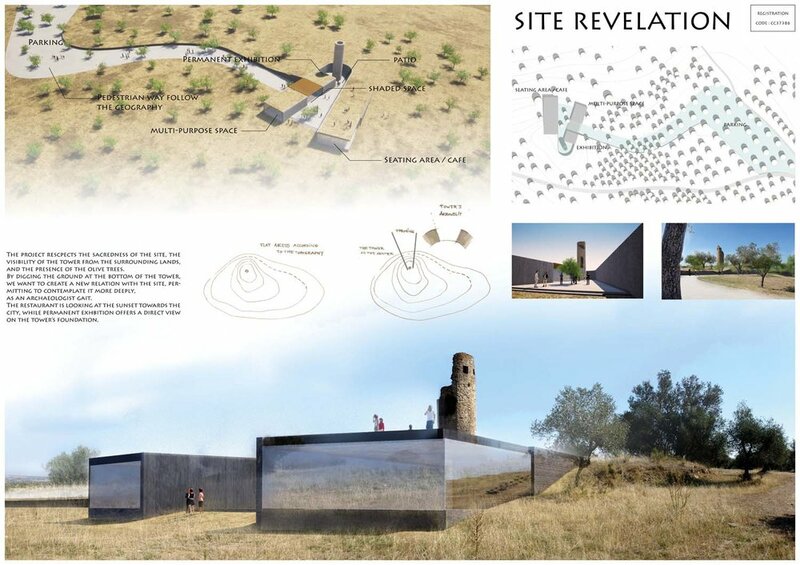 While seeking shadow the visitor will play the game of being inside or outside of the perimeter wall, while observing and considering the approach to the tower’s remains. 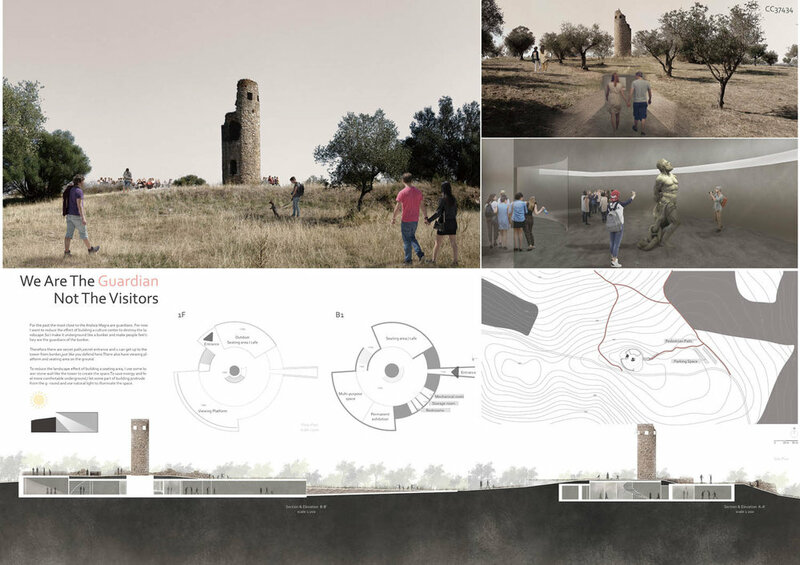 The intervention gives value to the tower and the landscape by respecting both in different ways. 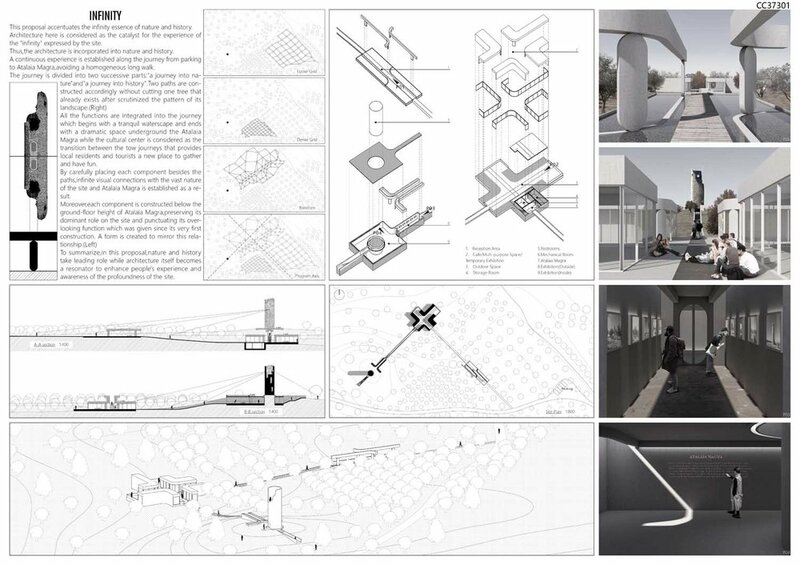 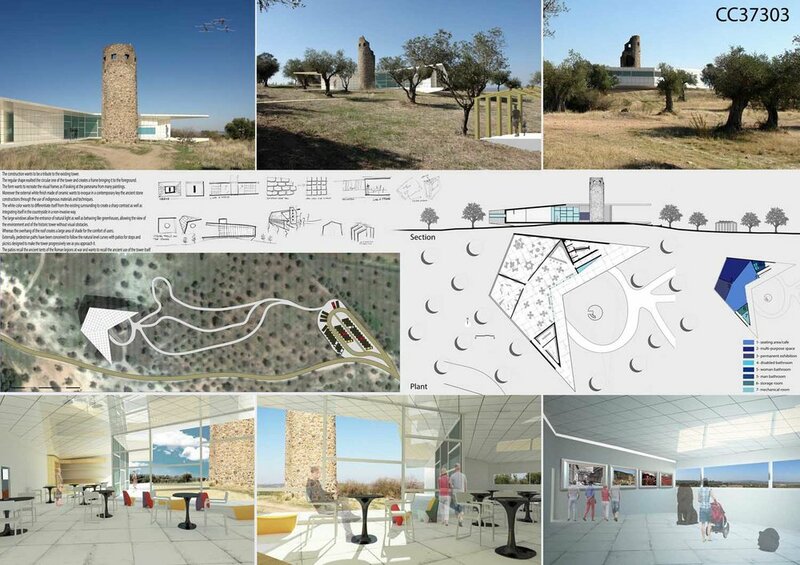 The constructed path achieves, with the minimum impact, a diversity of spaces and points of view around the tower. 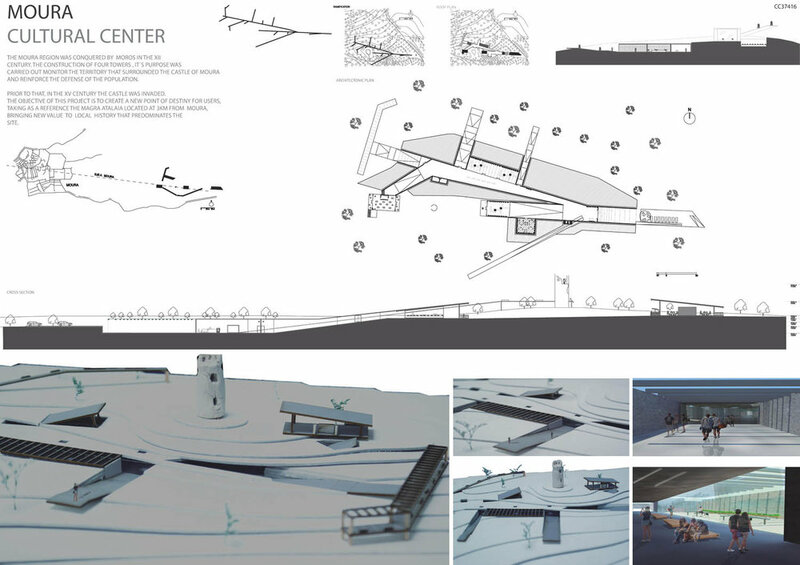 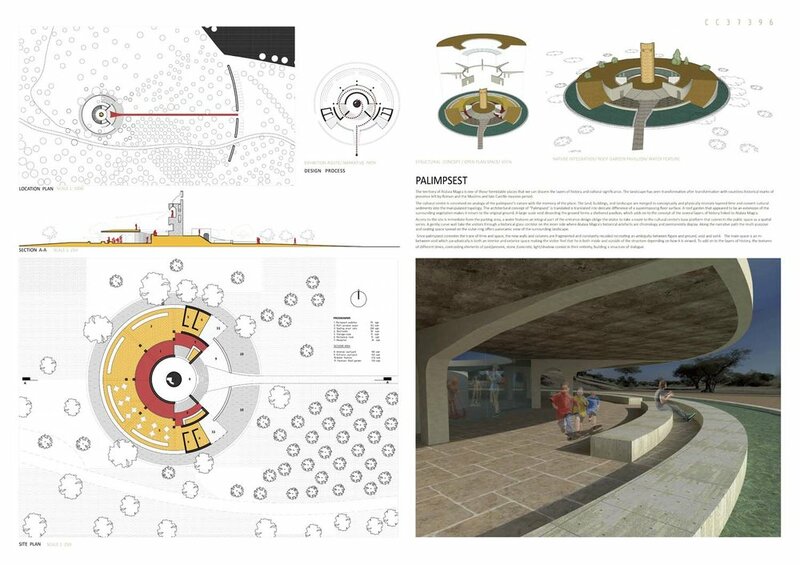 The asset on this project is the enclosed space in the middle that forms a public open space. 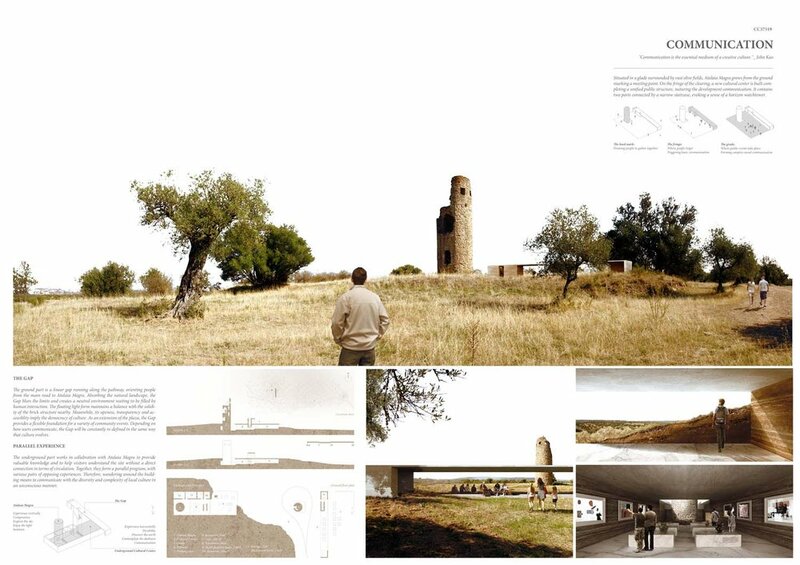 On the other hand, I don’t think the relationship of the tower with the landscape should be interrupted or drastically changed with a new object all around it. 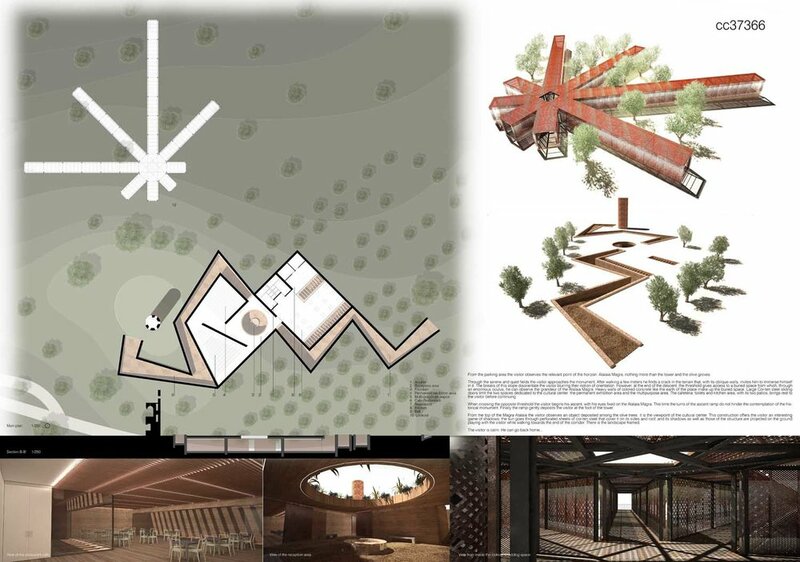 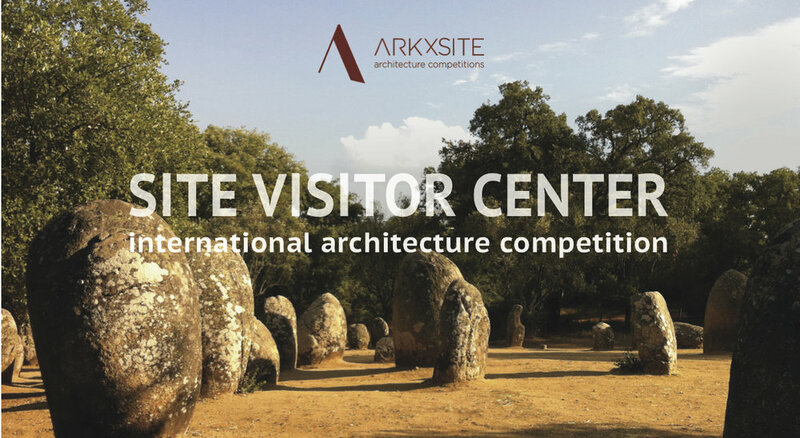 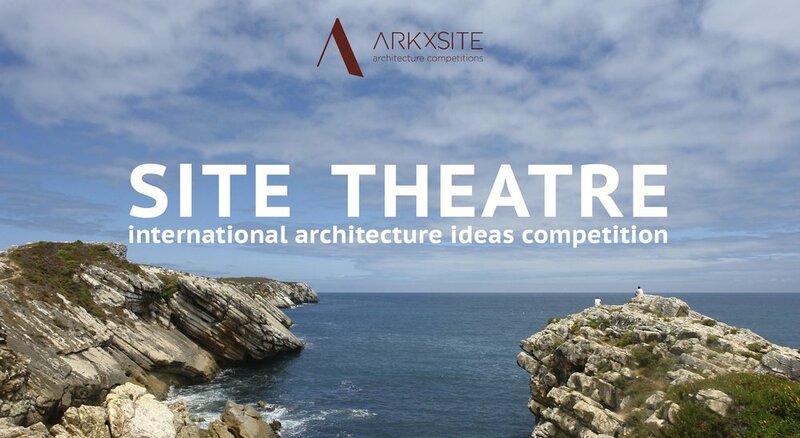 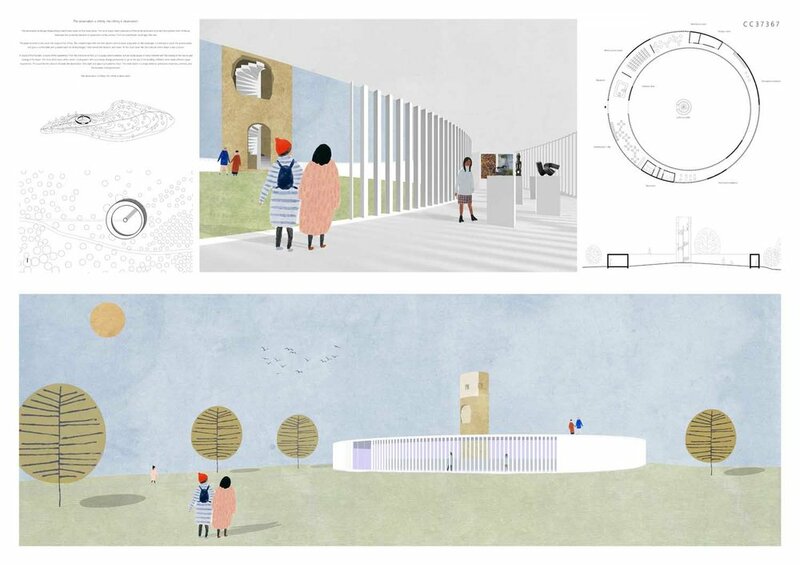 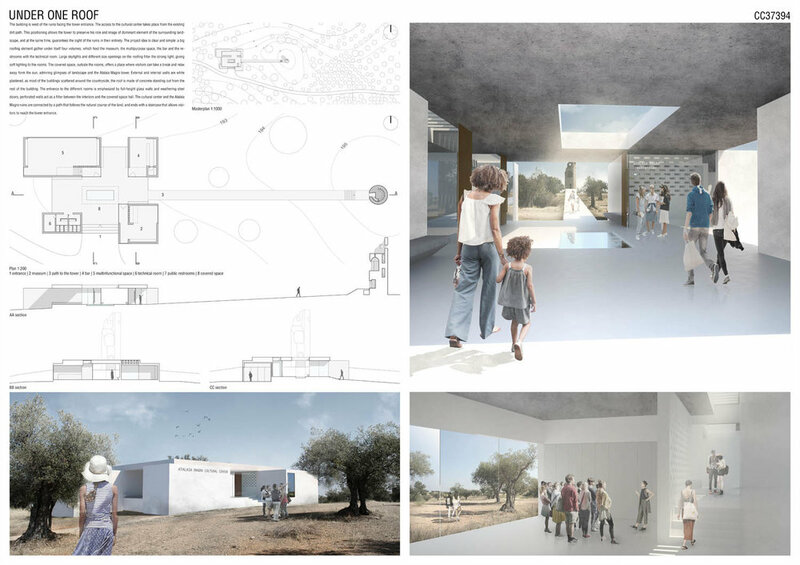 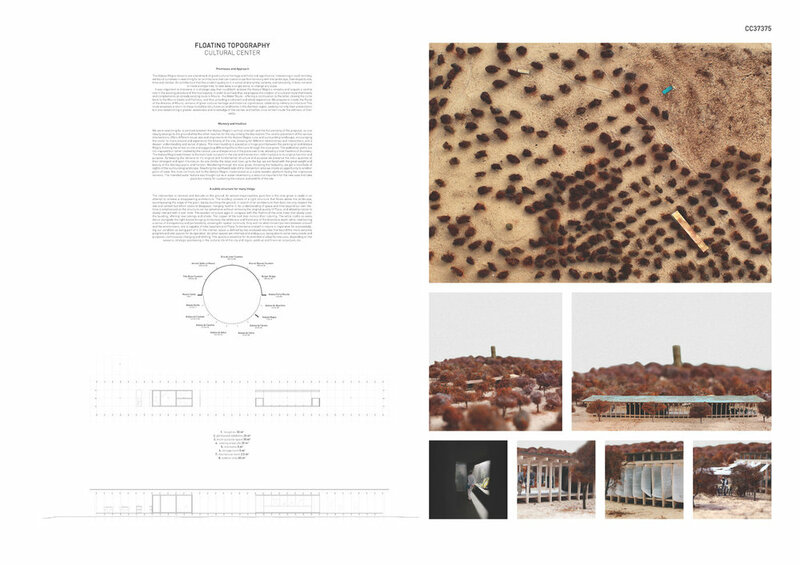 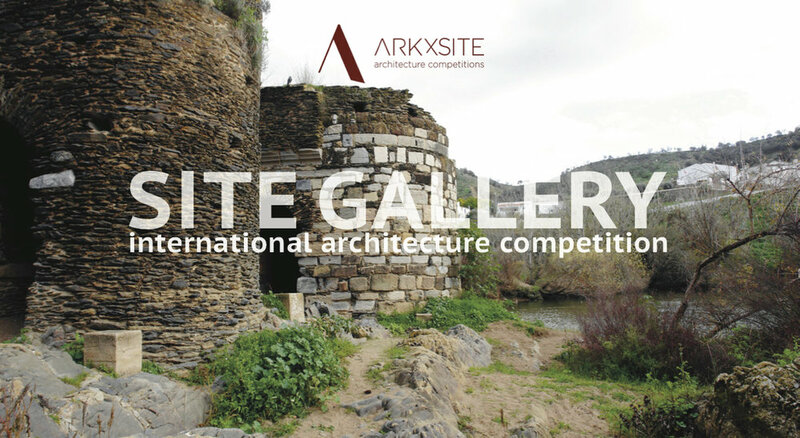 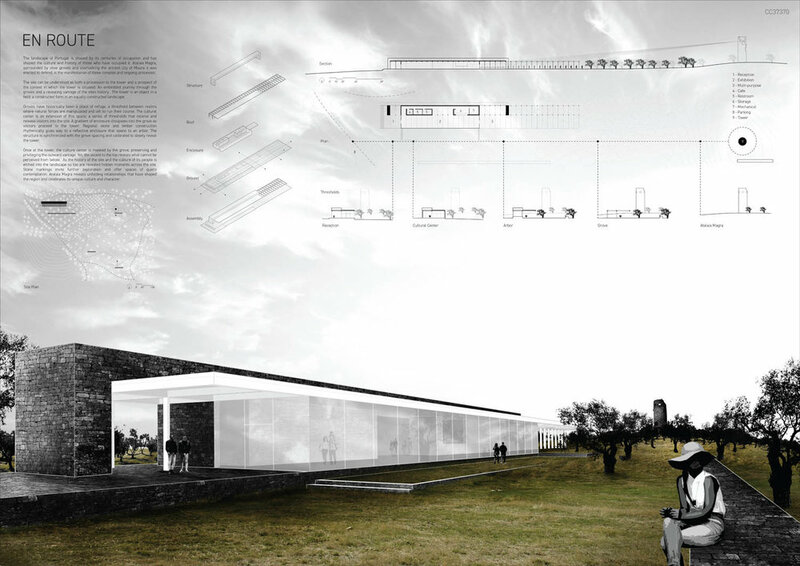 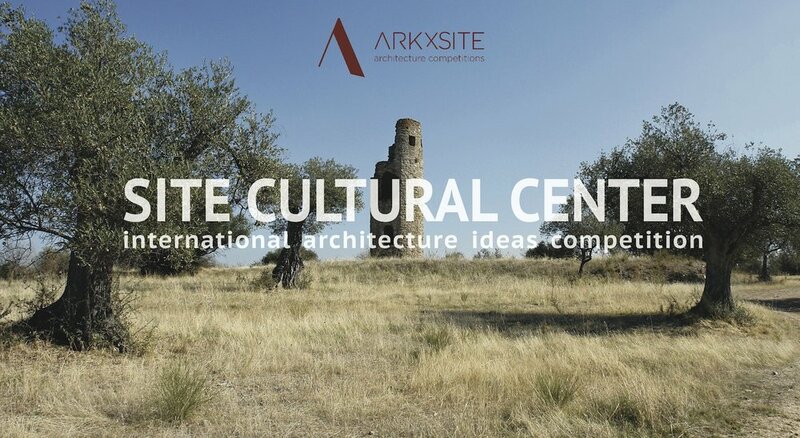 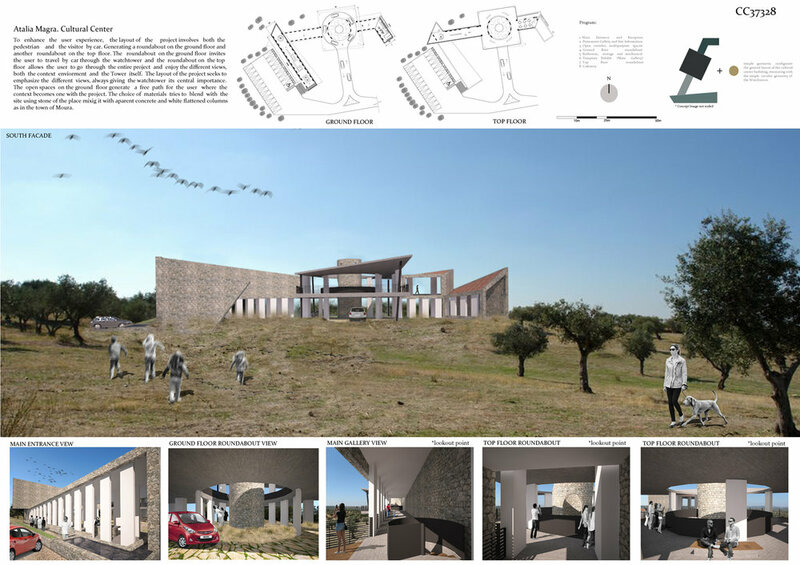 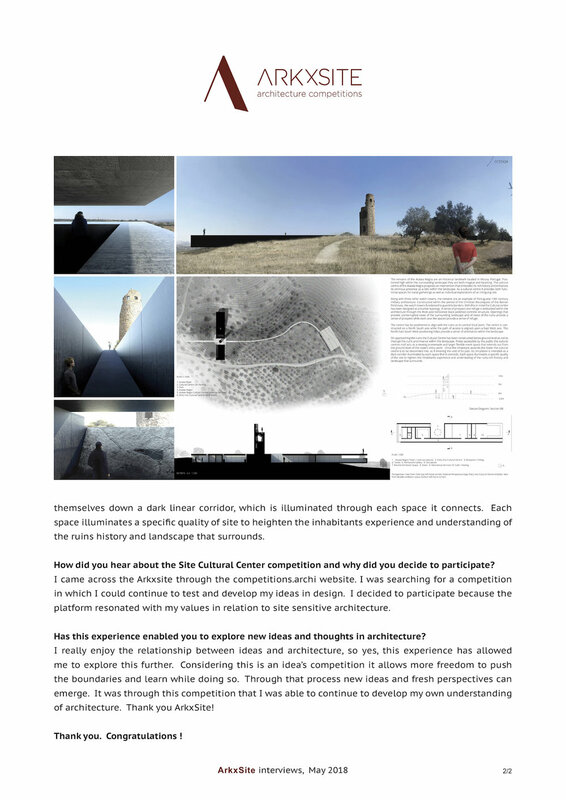 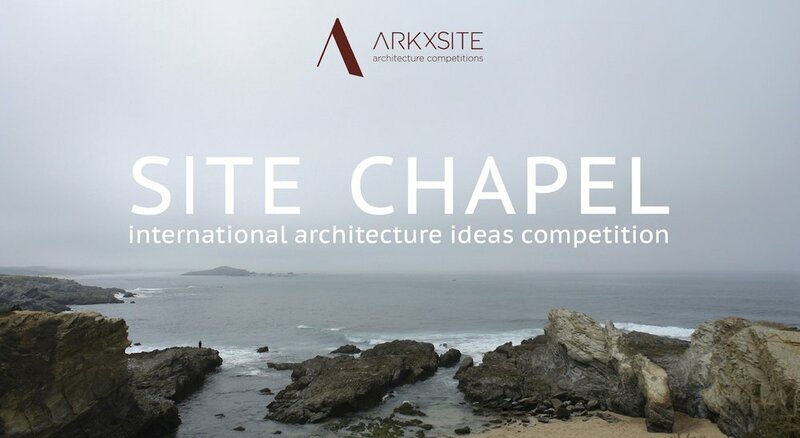 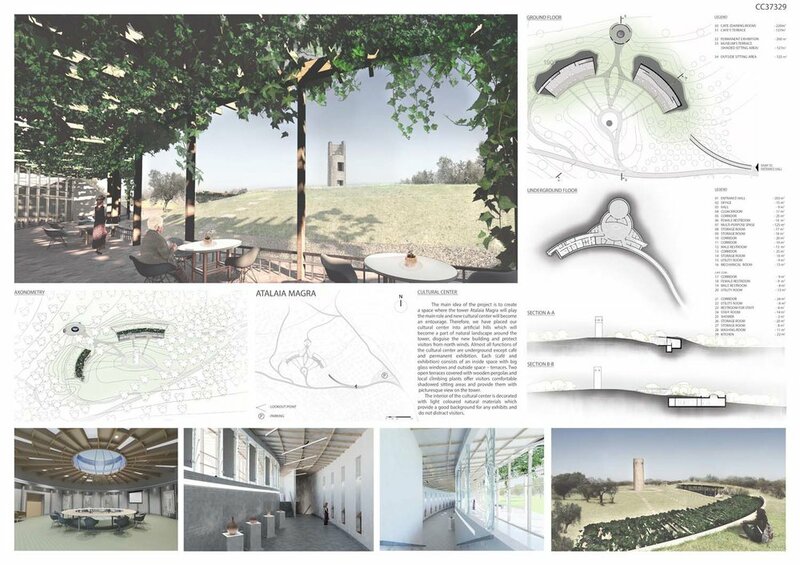 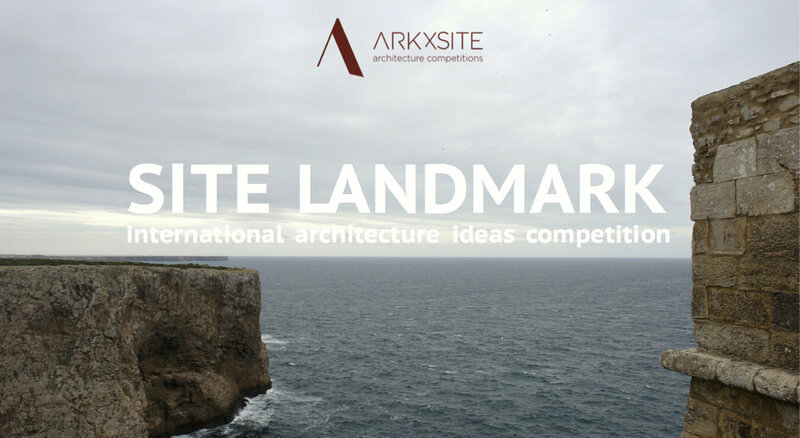 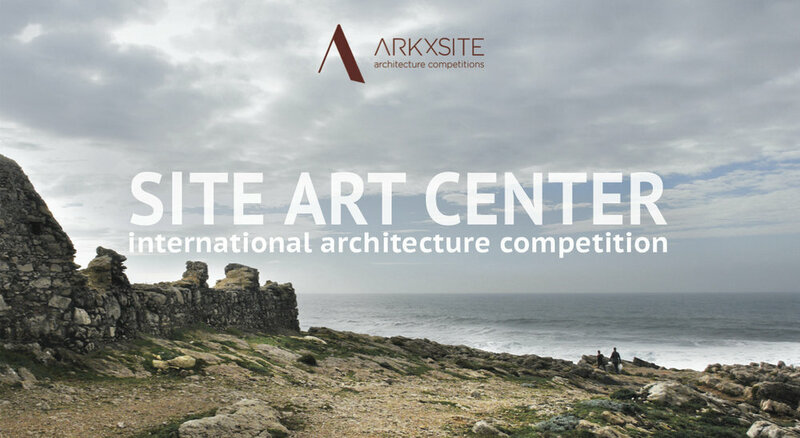 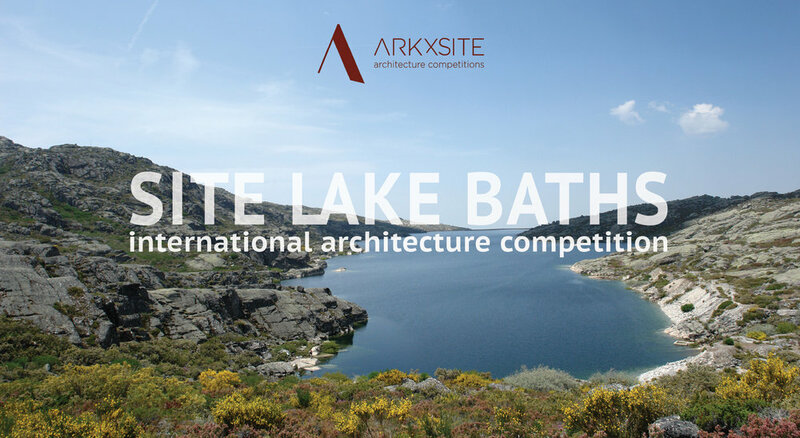 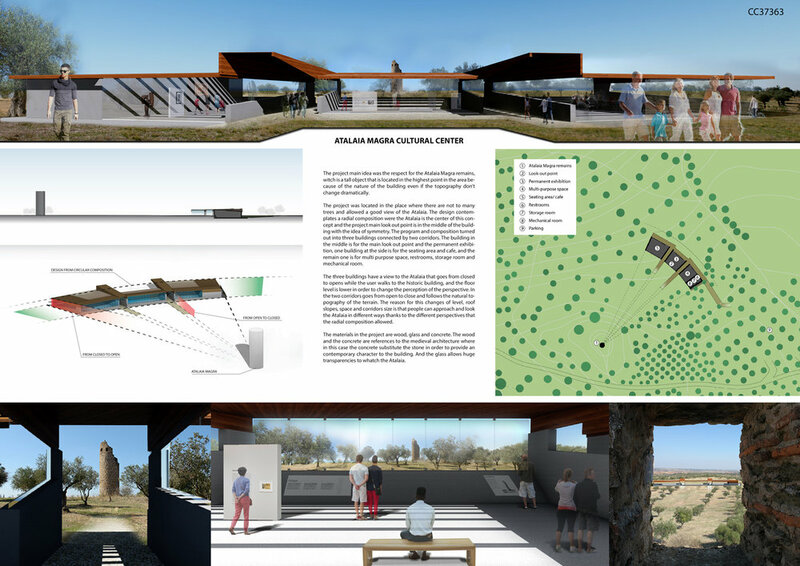 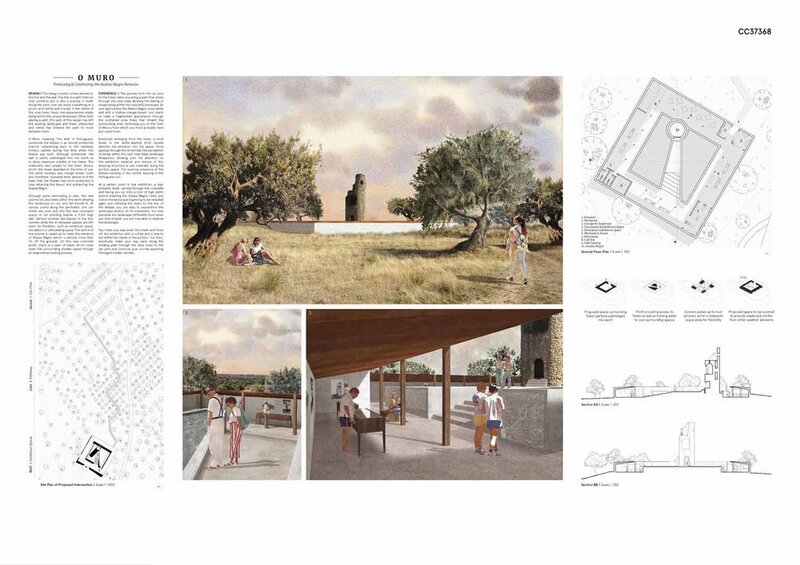 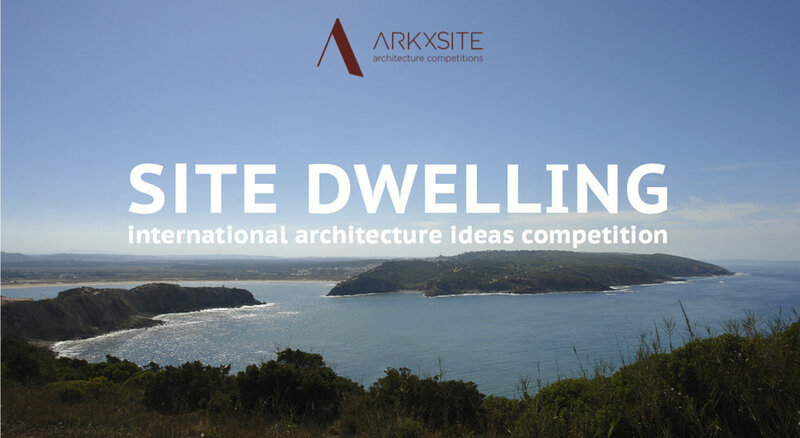 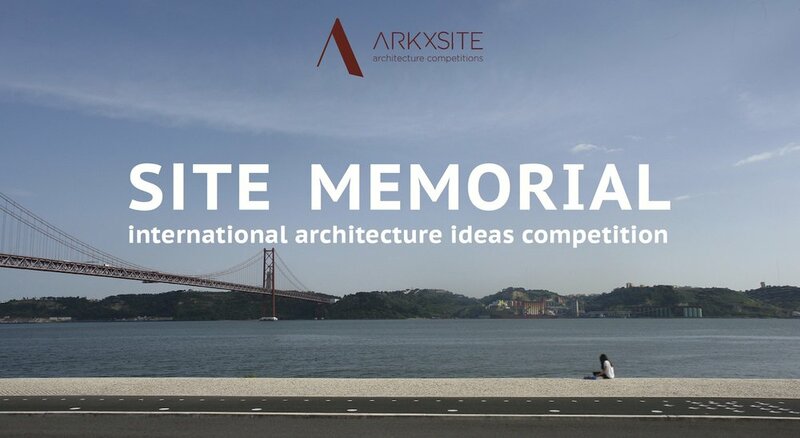 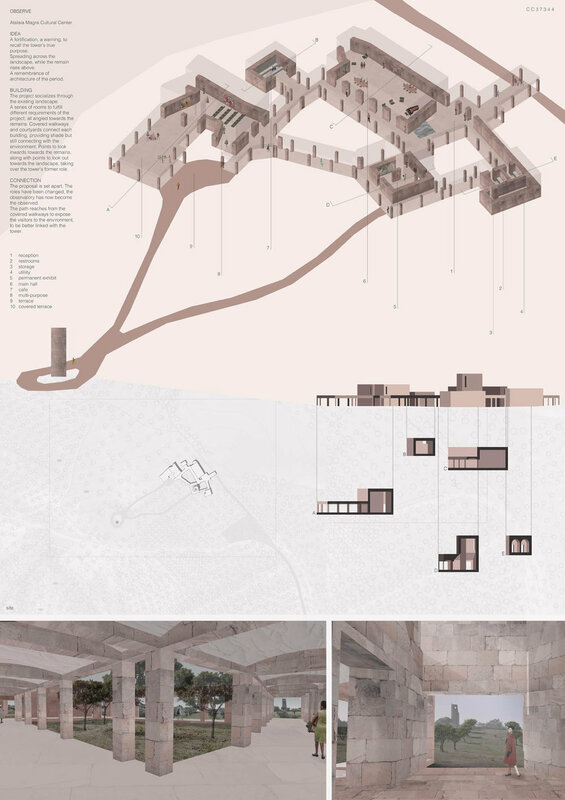 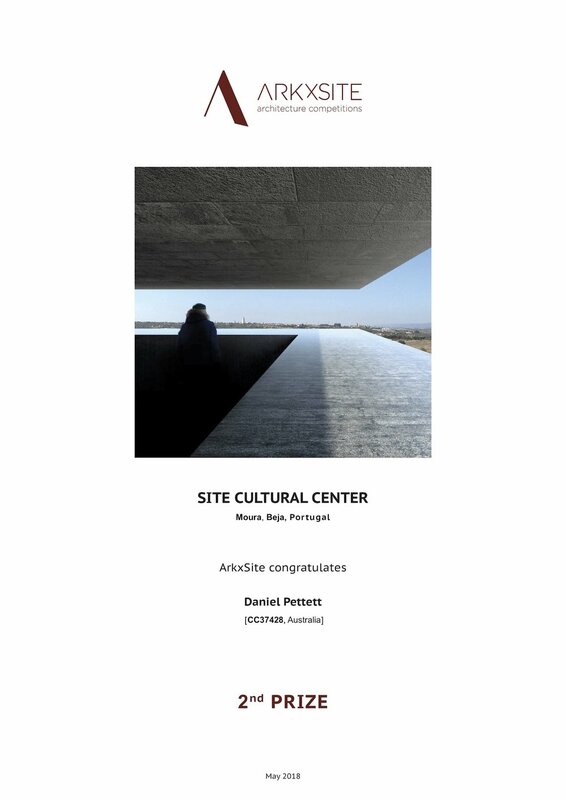 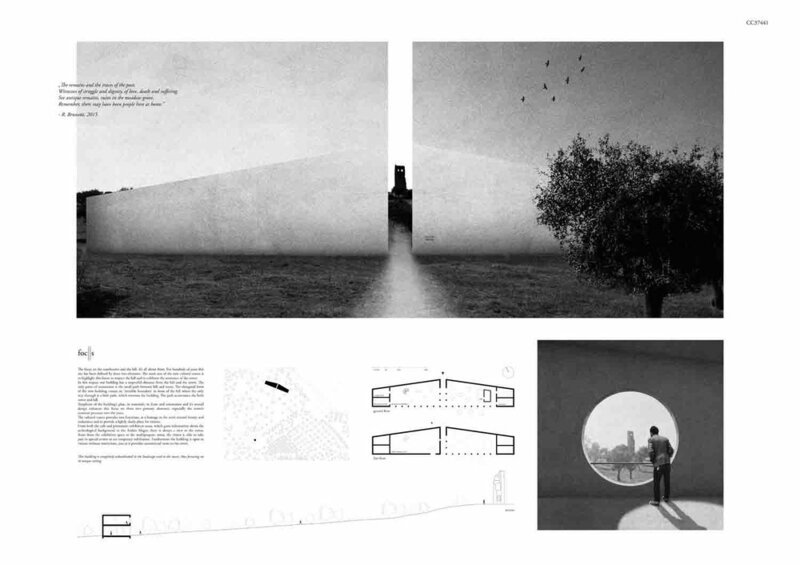 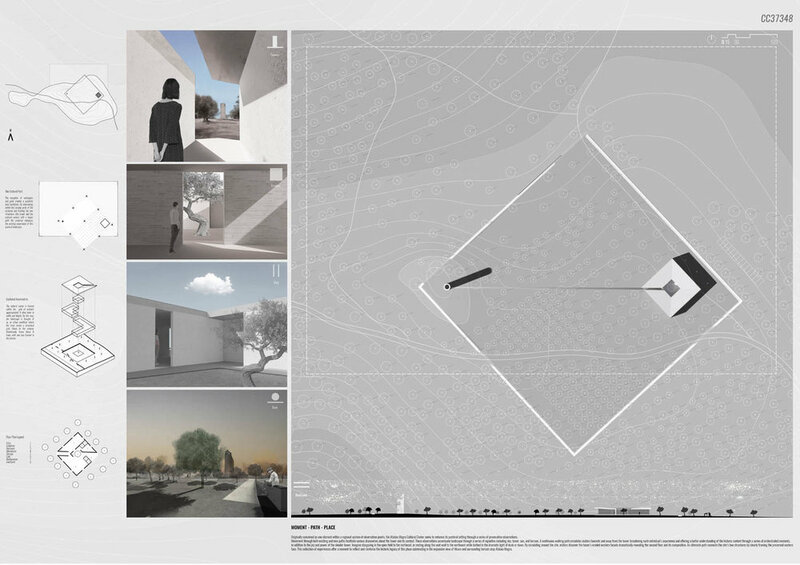 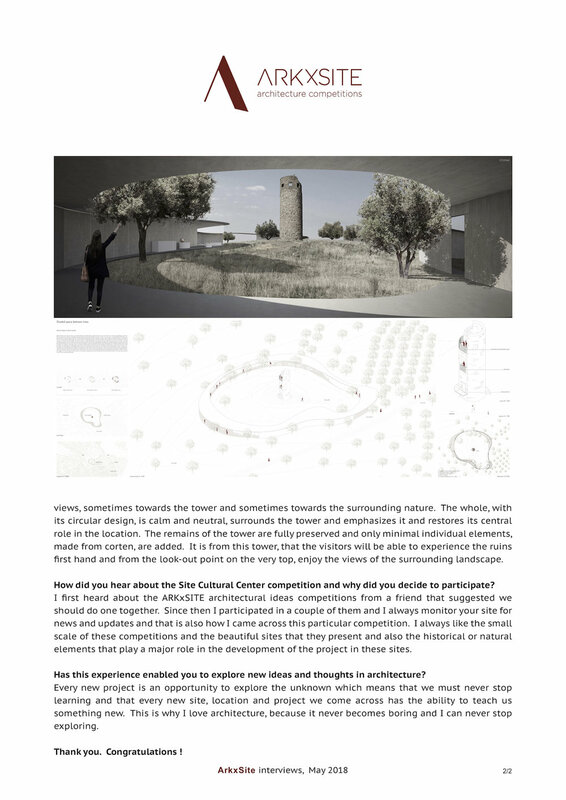 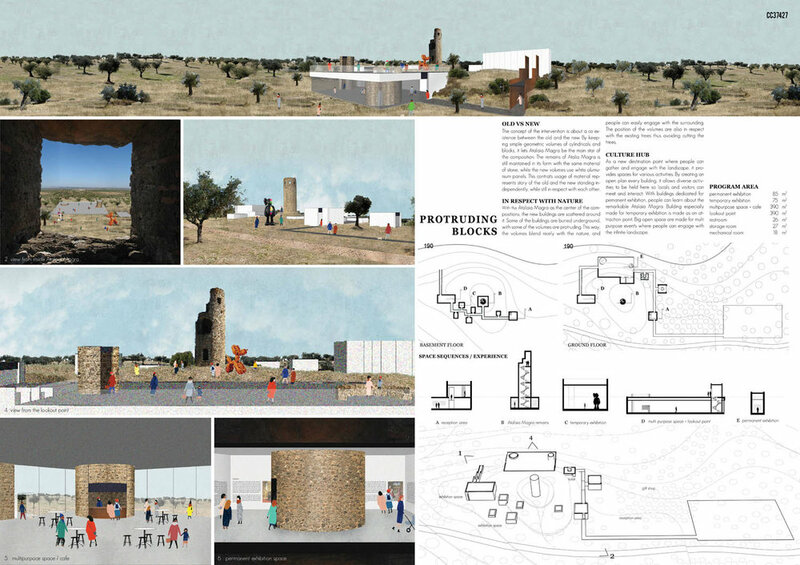 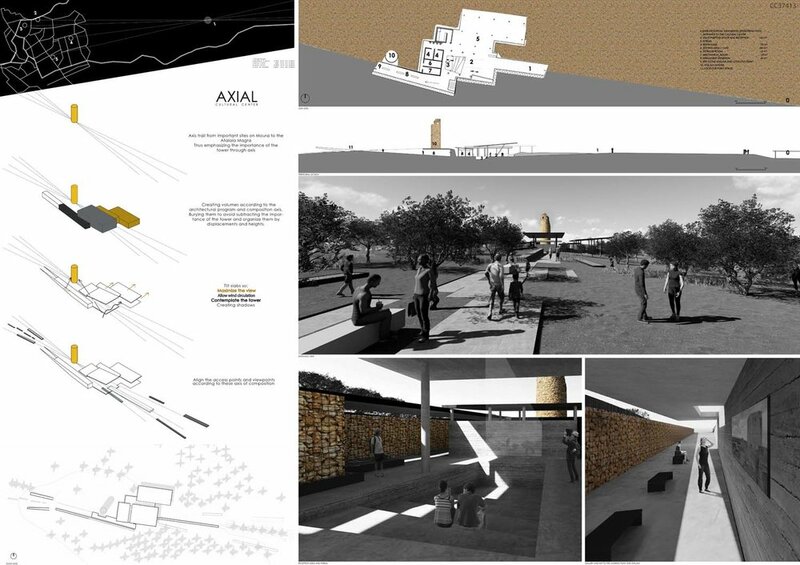 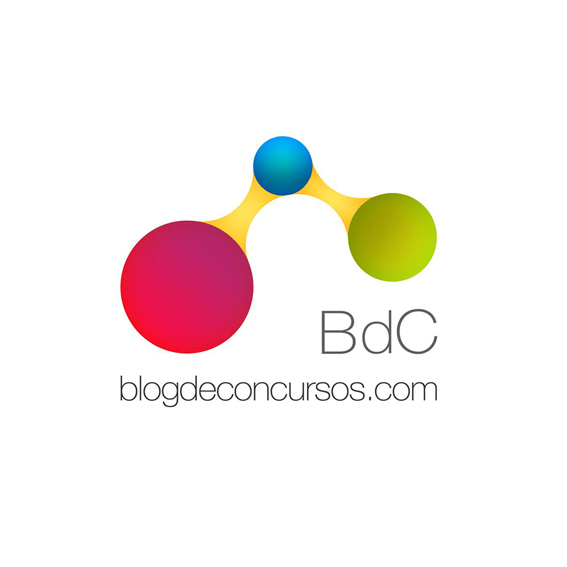 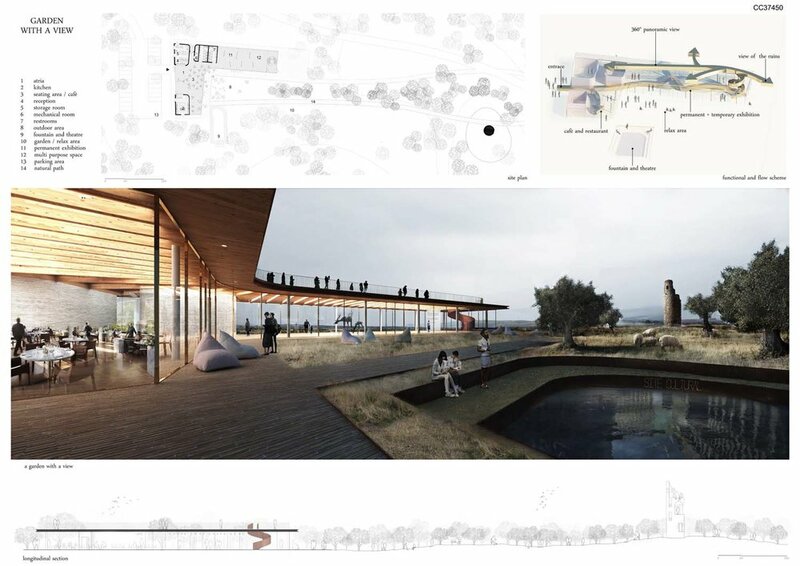 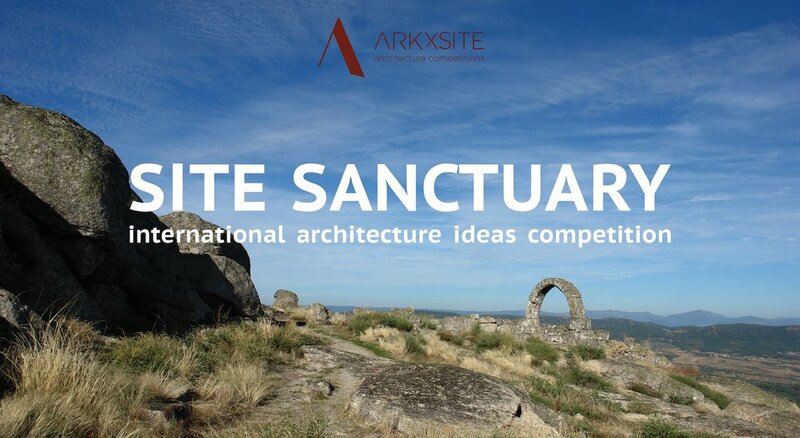 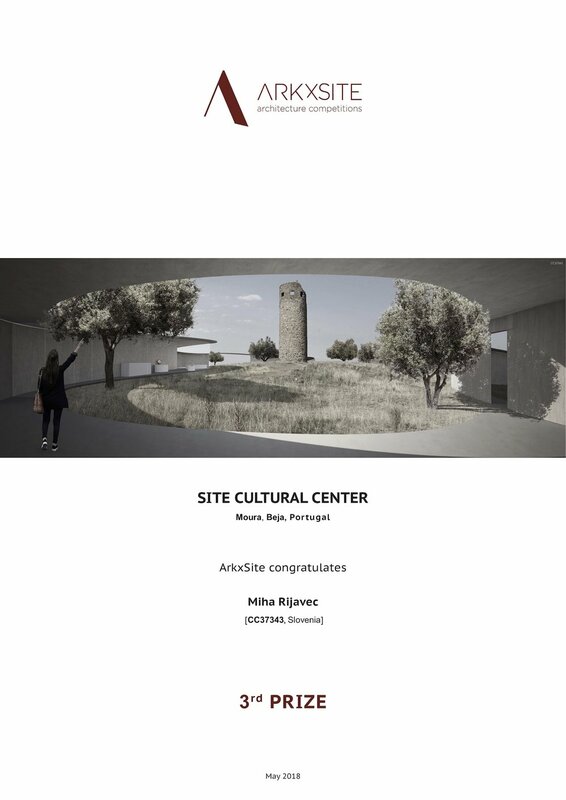 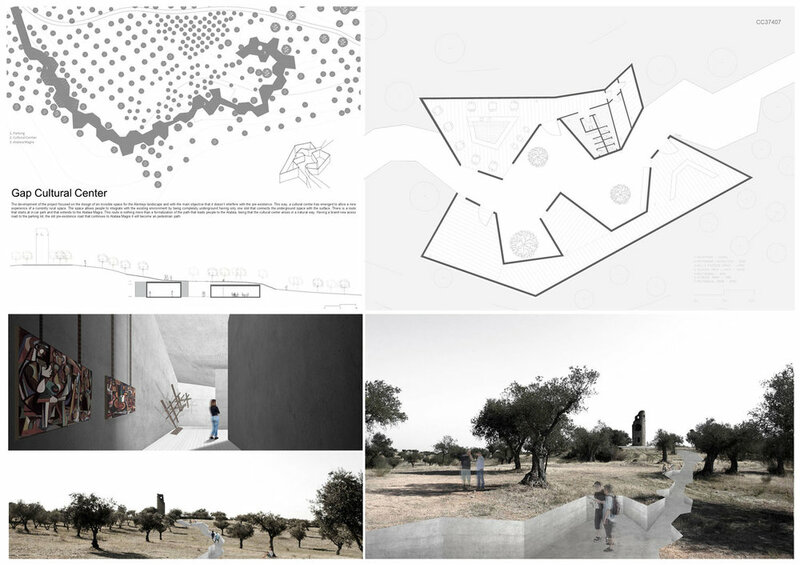 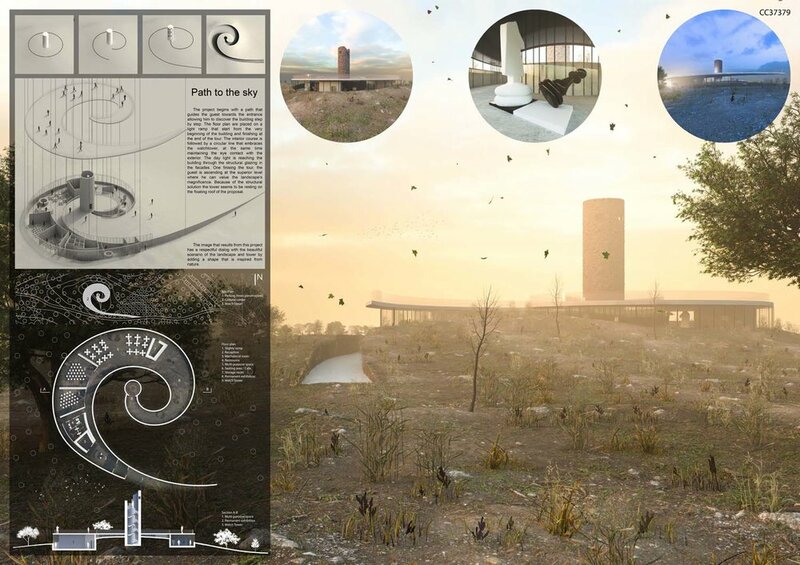 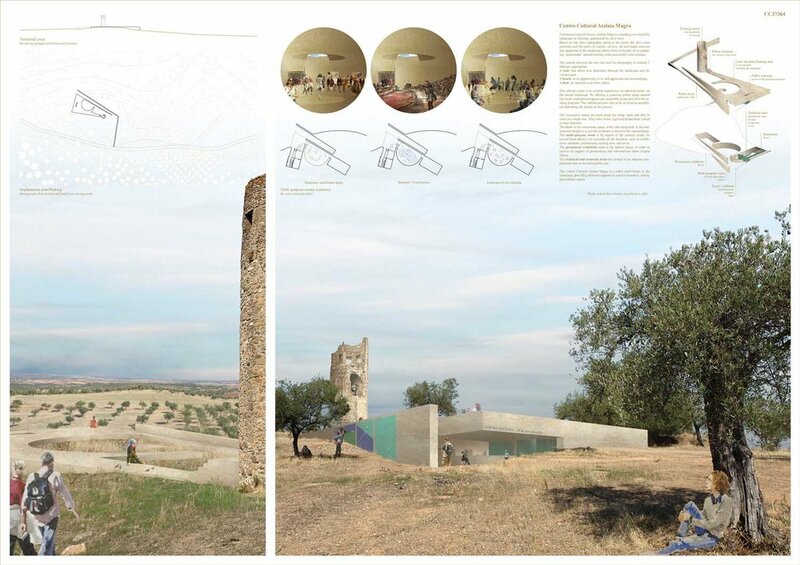 This international one-stage architecture ideas competition invites all architecture students, young architects and young professionals with a degree in architecture studies (≤ 40 years old) to develop and submit compelling ideas for the design of a Site Cultural Center located near the remarkable remains of the medieval watchtower Atalaia Magra near Moura, Beja, Portugal. 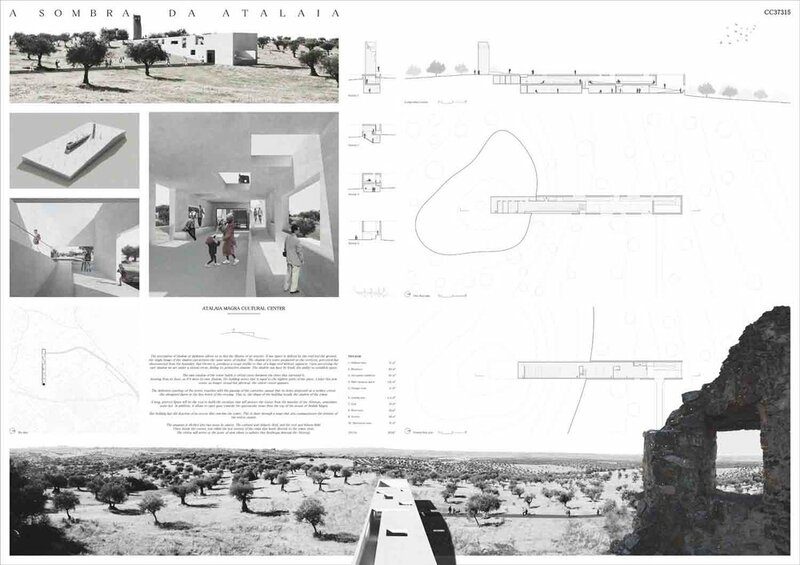 The Atalaia Magra remains are a landmark of great cultural heritage and historical significance with characteristics that must be fully preserved.